Dean Court York HotelA unique individual 4 Star hotel with unrivalled views of York Minster in the centre of the city with valet car park service. Lift to all but four rooms. D.C.H Restaurant overlooking the Minster, Lounge-Bar area with comfortable seating. Private dining/conference rooms. Unique individual hotel adjacent to York Minster in the centre of the city with valet car park service. Lift, Lounge Bar, Restaurant. Private dining/conference rooms. 4 rooms not accessible by lift Public rooms are air-conditioned Children welcome from any age. 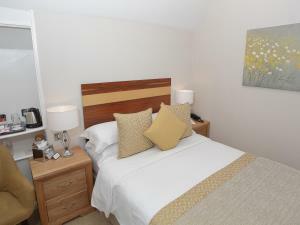 Dean Court York sometimes limits bookings to 2 or more days. 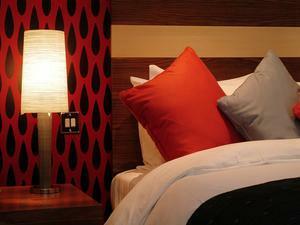 Deluxe Double sometimes limits bookings to 2 or more days. 4'6 double bed. Limited space around the bed. Travel east on the A64. Take the A1237 (York North and Thirsk). Continue for a few miles following the signs to Thirsk A19. At the 4th roundabout, which intersects the A19, turn right still following on the A19 (Rawcliffe/ Clifton). is on the left just before the Minster. Travel North on the M1. Pick up A1(M) North. Look for signs to York leading eventually to A64 York exit the follow directions as above. Take Fulford signs into York. At first roundabout take 2nd exit (straight ahead. Continue on road and over bridge (River Ouse. Go through first set of lights and turn right at the second set. Then at the next lights turn left. At the end at the top of a slight incline, get into the right hand lane to turn right at the next set of lights. After these lights immediately move over to the left hand lane and turn left at the next lights, which bring you over a bridge. Go straight through the next lights and the hotel is on the left just before the minster. Take A59 (junction 47). Follow signs for York. Turn left on to the A1237. Take second roundabout Rawcliffe/ Clifton then follow ** above. Turn left out of the station. Go through the first set of lights (after pedestrian crossing) then move into the left hand lane. At the next set of lights turn left and go over the bridge. At the next set of lights go straight ahead. The hotel is on the left just before York Minster. 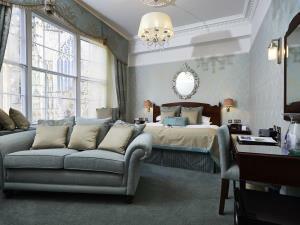 Comfortable room with great view of minster: All the staff were welcoming, friendly and helpful. Meals were excellent and the location could not be bettered. The only thing missing was a pool, but who needs that in York? We shall certainly visit again. Thanks to all.